This post is part of "The Sensationalist," a continuing series here at Experience Points in which we examine games' abilities to evoke emotions and sensations in video game players. Please have a look at the series' introduction as well its previous entries. My latest PopMatters article is now live: Divine Responsibility in From Dust. My original plan for this article was to discuss the sensation of responsibility in games in general using From Dust as a jumping off point. As a god game, however, From Dust raised too many interesting themes to casually brush aside. On the subject of responsibility alone, I believe there is an inverse relationship between the sensation of responsibility and the scale of the game. I have written before about how successfully Bioshock 2 creates a unique parental bond between Eleanor and Delta. Ico similarly creates a bond of responsibility between the protagonist and Yorda. These relationships are not predicated on weak supporting characters. I felt deeply responsible for the fate of my team in Mass Effect 2, despite knowing they were all loyal and proven soldiers. The tribesmen of From Dust are far more dependent on the player than the crew of the normandy is on Shepard, yet my feelings of responsibility dwindled as the game progressed and I become both more powerful and more busy. How can we talk about a god game without talking about god? Naturally, my mixed feelings about the game's attempt to personalize the relationship between the player and her flock brought reflected some of my own interests in divinity and spirituality in From Dust. I should say I am not a religious person. I am agnostic at my most devout, although I find religion a deeply interesting and important topic. While contemplating the prayers From Dust's villagers shout to the heavens and my own mostly catholic upbringing, I wondered how my island inhabitants would interpret the failings of their minor deity. As I grew distant, why did they not turn to a different god, perhaps the one causing all the devastation in the first place? 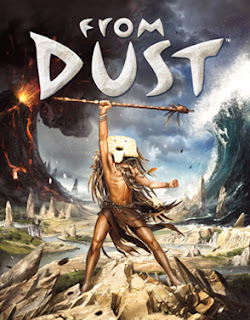 From Dust is a decent experience and more than a little interesting, but when think upon my time spend with the villagers I feel sadly disconnected. I feel uncomfortable playing an impersonal and inadequate god who fails to maintain divine responsibility. Well, you guys are very brave to promise a viewing of the Dead Space movie. We discussed some of the transmedia stuff surrounding the release of Dead Space over on the Moving Pixels podcast some months back, and I subjected myself to the experiemce of that film for the sake of the 'cast. All I can say is have a stiff drink before viewing, but you probably will still feel that someone owes you an hour and a half of your life back. Oops... I meant this comment to appear with the previous post. Sorry about that. After watching it, I now understand what you mean about the Dead Space movie. On the bright side, I get to look forward to a future in which my health meter is integrated with my clothing.